A class 3 boat starts to get wider in the beam but could run in length from 17; to 40;. 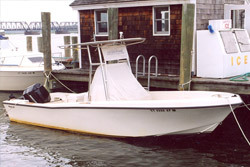 Any class 1 or class 2 boat with the addition of a hard top/t-top is elevated to a class 3 boat. 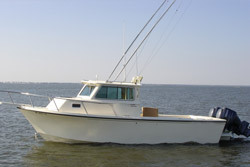 Class 3 boats also may have an enclosed main cabin and may or may not have a cabin below the front deck. 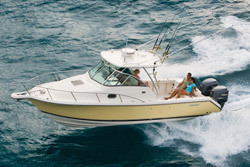 Some of the additions to these boats are a bridge on the top of the cabin such as on a 28' Bertram or a 30' Sea Ray Sedan. Radar arches are not usually found on these boats.